Stuttgart, April 2019 – At this year’s Chinaplas (21-24 May 2019, Guangzhou, China) Coperion GmbH, Stuttgart, Germany, presents itself as a total technology solution provider for all plastics processing applications. Just in time for the 15th anniversary of the STS twin screw extruder, Coperion has expanded this extruder series by one more extruder size: The new STS 25 Mc11 extruder with a 25 mm screw diameter is designed especially for research and development tasks as well as for production of small batch sizes and will be shown for the first time at the Coperion booth 5.1M11 in Hall 5.1. In addition Coperion will present a twin screw extruder ZSK 58 Mc18, an SP 320 treasure strand pelletizer, a highly accurate Coperion K-Tron Quick Change twin screw feeder outfitted with ActiFlow™ bulk solids activator, Electronic Pressure Compensation (EPC) and 2415 vacuum receiver for refill as well as the unique K-ML-BSP-150-S Bulk Solids Pump™ (BSP) feeder for granular materials. Also on display is Coperion’s dual channel diverter valve WZKC for powders and granular products and a ZVH rotary valve. The new STS 25 Mc11 extruder boasts all the advantages of the STS Mc11 series. It has a simple design, is operator-friendly and easy to clean. It is ideally suited for the production of small batch sizes of 2 kg and more and achieves throughputs of up to 90 kg/h. By having the same screw diameter ratio Do/Di (outer screw diameter to inner screw diameter) of 1.55 and the same maximum specific torque Md/a³ of 11.3 Nm/cm³ as the rest of the STS Mc11 extruder series, production parameters of the STS 25 Mc11 can be reliably scaled up to larger STS sizes. The STS 25 Mc11 which Coperion will exhibit at Chinaplas will be shown with the Coperion K-Tron K-ML-SFS-KT20 twin screw feeder. As a representative of its high-end ZSK twin screw extruder series, Coperion will exhibit a ZSK 58 Mc18 extruder with 58 mm screw diameter at this year’s Chinaplas. With its specific torque of 18 Nm/cm3 it reaches highest throughput rates while working very energy efficient. The ZSK 58 Mc18 will be on display outfitted with a highly accurate Coperion K-Tron feeder: a K2-ML-D5-S60 single screw feeder for free flowing pellets or powders. The strand pelletizer SP 320 treasure on display is ideally suited for processing of highly abrasive reinforced products. It has a working width of 320 mm, can process up to 80 strands at throughput rates of up to 2,500 kg/h. The SP treasure strand pelletizer is exclusively tailored to the Chinese market. It has an excellent quality standard and an attractive price/performance ratio. It was developed through close cooperation between Coperion Pelletizing Technology, Offenbach, Germany and Coperion Nanjing, China. Coperion Pelletizing Technology is responsible for the design and produces the cutting chamber, with the rest of the assembly manufactured locally in Nanjing. Coperion K-Tron will exhibit a highly accurate K2-ML-D5-T35/S60 Quick Change feeder at Chinaplas, featuring the ActiFlow™ bulk solids activator and Electronic Pressure Compensation (EPC) in combination with a 2400 Series vacuum receiver for refill. The T35/S60 Quick Change feeder (QC) is designed for applications requiring quick changeover of materials and convenience of fast cleaning. The QC feeder allows for the removal of the entire feeding module with screws in place for replacement with a second unit. The removed feeding module can then be transported to a cleaning facility for further disassembly, cleaning and prepped for another material. Twin and single screw feeding modules are available. Single screw feeding units handle free flowing powders, granules, pellets and other non-flooding materials, while twin screw units are ideal for floodable powders and more difficult, sticky or hard-to-flow materials. 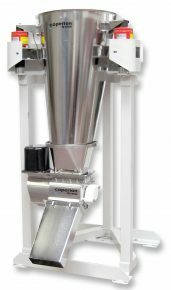 The ActiFlow™ smart bulk solids activator offers an innovative method to reliably prevent bridging and rat-holing of cohesive bulk materials in stainless steel hoppers without internal hopper agitation. ActiFlow is a non-product contact device, consisting of a patent-pending vibratory drive and intelligent control unit, designed specifically to work with Coperion K-Tron’s line of gravimetric loss-in-weight feeders. Together with the ActiFlow control unit, it continuously activates the material inside the hopper with an optimized frequency and amplitude, without exerting any mechanical force on the bulk material. The T35 is also equipped with Coperion K-Tron’s unique Electronic Pressure Compensation system (EPC) for loss-in-weight feeders. EPC is a clever but simple electronic solution for accurate and steady pressure compensation in feeder hoppers and outlets. The 2400 Series vacuum receivers provide a high capacity sequencing system primarily used where larger conveying rates or long distances are required, in applications with one or multiple destinations. They are designed to high quality standards for pneumatically conveying powder, pellet and granular materials for the bulk materials handling industries. Conveying rates range from 720 to 15,000 lb/h (327 to 6,804 kg/h). On display will be the 2415 Pellet Receiver. Also on display, Coperion K-Tron’s K-ML-BSP-150-S Bulk Solids Pump™ (BSP) feeder which is a unique alternative for gentle feeding of free flowing granular materials. The BSP feeder does not use the usual screws/augers, belts or vibratory trays to convey the material. 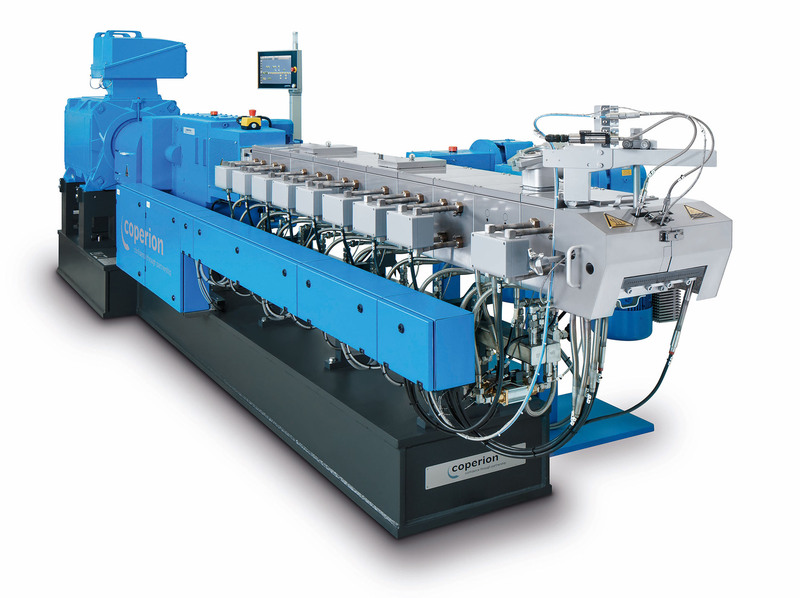 Instead it utilizes positive displacement action to feed free flowing materials with astounding accuracy, offering uniform discharge, consistent volume and gentle handling. The BSP feeder has vertical rotating discs that create feeding ducts. Material moves smoothly from storage hopper to discharge outlet through a “product lock-up zone”, achieving true linear mass flow. With no pockets or screws and only one moving part, the compact feeder is cleaned in seconds, making it ideal for applications with frequent material changes. 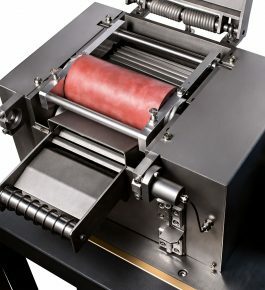 The BSP-150-S feeds from 34 to 6700 dm3/h [1.2 to 237 ft3/h] using five feeding discs to create four feeding ducts; it features a stainless steel feeder body and uses a stepper motor. Two additional models are available for smaller feed rates. Coperion is the international market and technology leader in compounding and extrusion systems, feeding and weighing technology, bulk materials handling systems and services. Coperion designs, develops, manufactures and maintains systems, machines and components for the plastics, chemicals, pharmaceutical, food and minerals industries. Within its four divisions – Compounding & Extrusion, Equipment & Systems, Materials Handling and Service – Coperion has 2,500 employees and nearly 30 sales and service companies worldwide. Coperion K-Tron is part of the Equipment & Systems division of Coperion. For more information visit www.coperion.com or email [email protected].